Let’s quickly walk down memory lane, shall we? 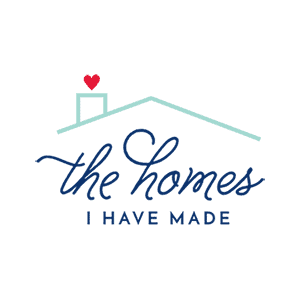 About 5 years ago, we were living in Camp Lejeune, North Carolina, and I was deep into rescuing and transforming old furniture. 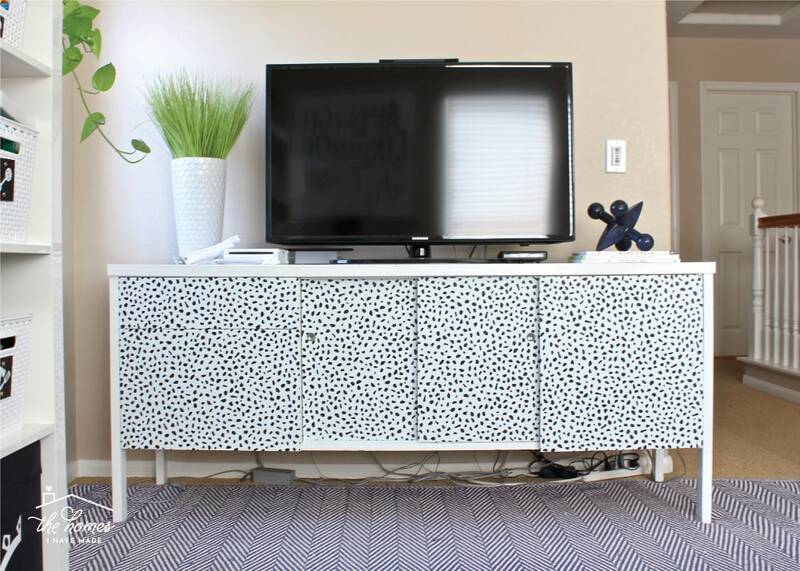 I found this very old, very banged up, and VERY heavy office credenza at the local ReStore and knew it not only had great design potential, but also could be functional in a variety of spaces. 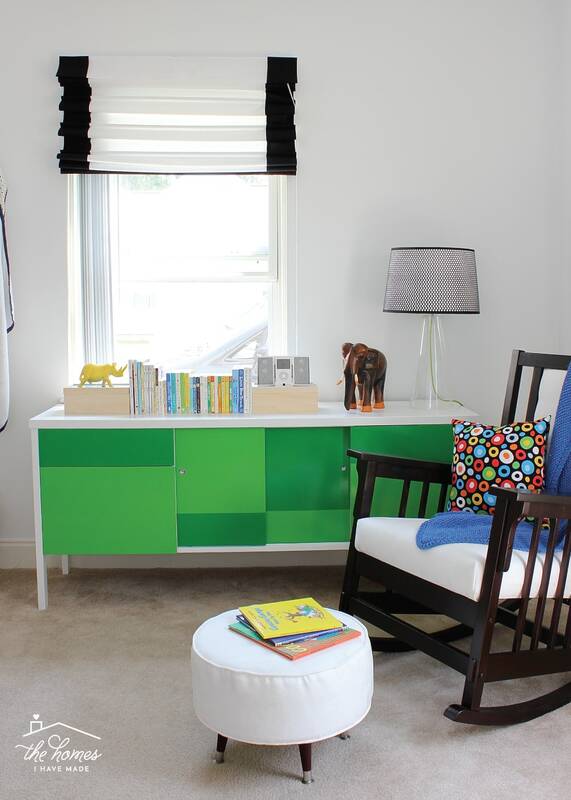 After much repair work, I specifically chose to paint the frame of the piece white and gave only the doors and drawers a bold and wacky geometric treatment in two shades of green (you can see more of this makeover here). Although very wild (perfect for Henry’s bedroom at the time), I knew this approach would allow me to easily change the whole piece down the road by simply updating the doors and drawers (which come off easily), rather than having to paint the entire (heavy) unit over and over. 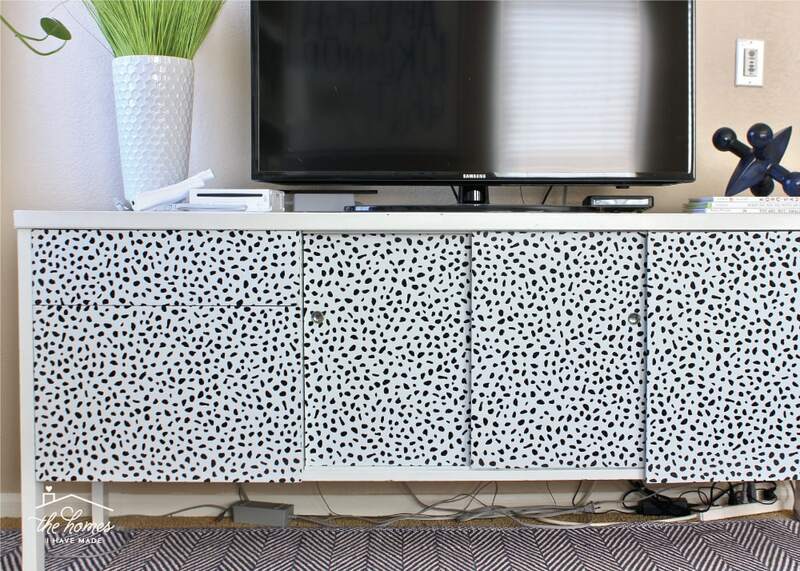 When we moved into our current home, the credenza found a happy home in our playroom. 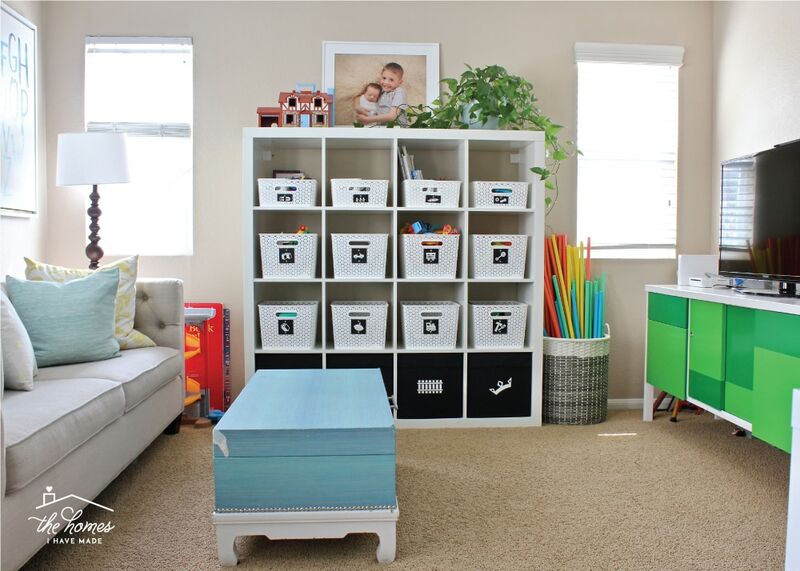 Its size, style and functionality are ideal for video game playing and toy storage; but as the design for the playroom started to evolve, the green became problematic (as I knew it eventually would!). Not only do the yellow undertones of the green cabinet not work with the beige walls and carpet, I ever-so-slowly started to build a blue, white, and black scheme for this room, and I just couldn’t make the green work. I really wanted to match this cabinet to the new scheme for this space, but I was having a lot of trouble finding the time, energy, and desire to re-paint…even just the doors. They were painted with very high quality paint (which was still in pristine condition all these years later! ); and I just wasn’t sure I was fully ready to kiss the green goodbye for good. After weighing lots of options and analyzing different design ideas, I finally decided to wrap each of the doors in some fun peel-and-stick wallpaper instead of painting them. And guys…the whole piece turned out even better than I imagined! In less than 2 hours…start to finish (seriously!!! ), the cabinet now has a fun and fresh new look thanks to a single roll of peel-and-stick wallpaper! Not only did using peel-and-stick wallpaper to cover these doors and drawers save me a lot of time, but the original paint job is still perfectly in tact should we want to go back to it in a future house. It’s a win, win! This is certainly not the first time I’ve worked with peel-and-stick wallpaper, even on furniture. But as I worked to complete this project, I couldn’t help but feel like I should rely on this method more. 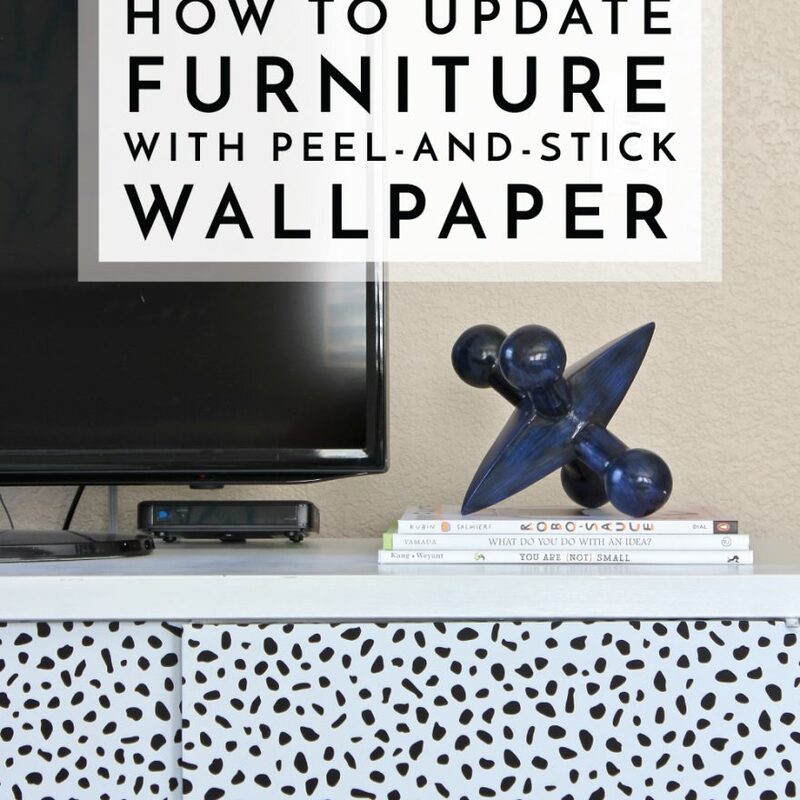 Using wallpaper to update furniture really is such a quick-and-easy project, bringing almost instant design gratification without a lot of work or mess. Here are some of the other reasons this is a transformation method worth considering! Adding pattern to a space is one of the quickest and easiest ways to liven it up, but you may be nervous to splash a big, bold design across your wall. 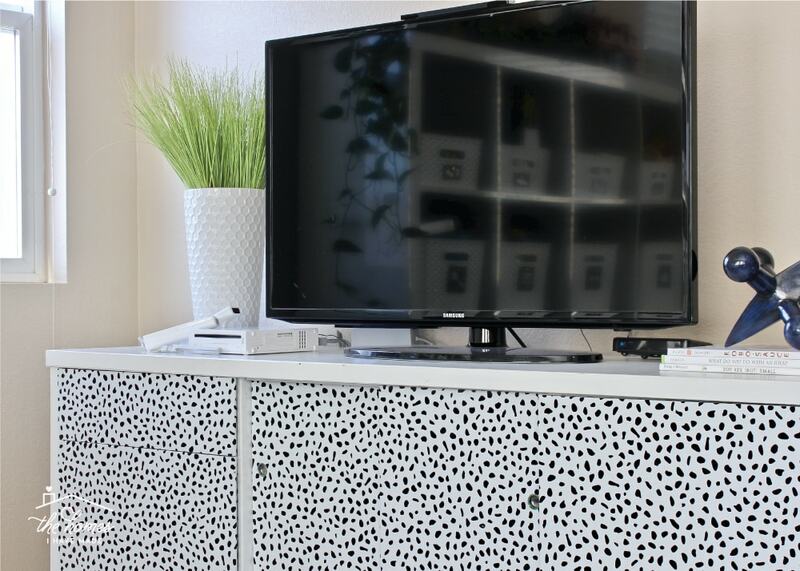 Using a bold pattern on a smaller piece of furniture allows you to create a focal point without the commitment (and cost) of a larger installation. 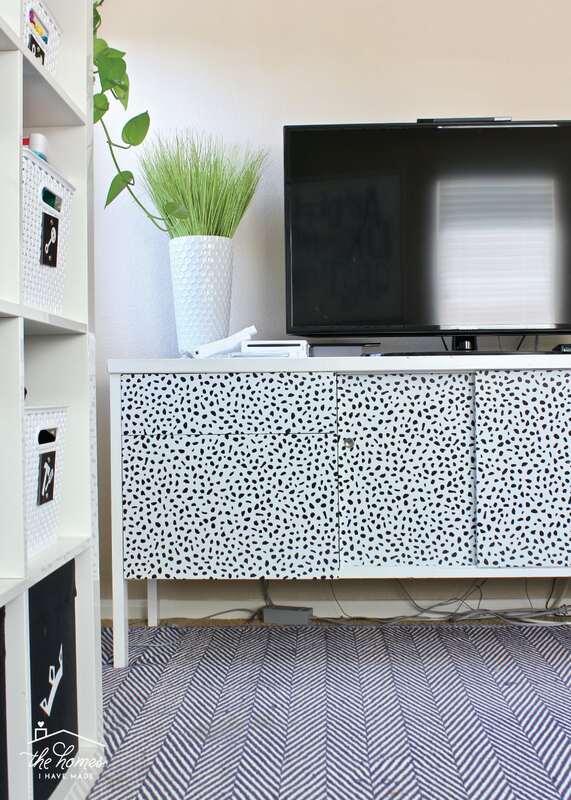 Further, if you have a piece of furniture that is screaming for a fun pattern, a printed paper is likely your safest bet. 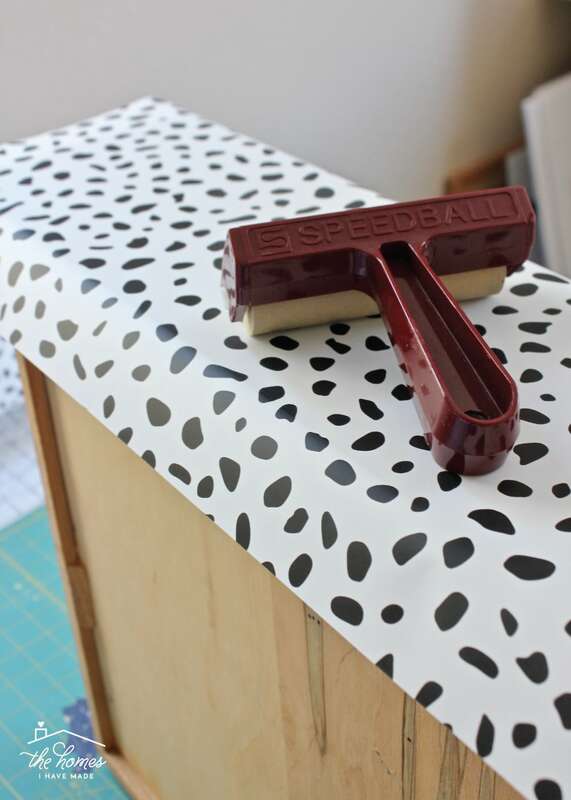 Unless you’re a gifted artist and/or brave enough to paint patterns by hand, using pre-printed wallpaper is a fool-proof way to get stripes, spots or flowers on your furniture! You may really want to change the look of a certain piece of furniture but may not want to paint it for a variety of reasons. 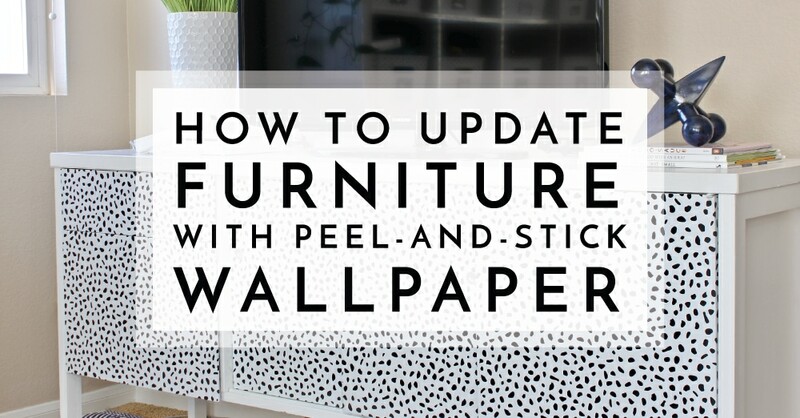 Using peel-and-stick wallpaper is a great way to make a temporary change that can quickly and easily be un-done. Most peel-and-stick products can be removed without damaging the paint or finish, but I do recommend testing it before you undertake a massive makeover. For me, the paint we used on this cabinet was a VERY high-quality paint, and our paint job is actually still in very good condition. I simply wasn’t ready to sand off or paint over the green paint yet, so a temporary covering was an ideal solution. Right now, I am living and breathing by nap time. Meaning, I mostly only undertake projects that can be completed within one, maybe two, naps; and those projects need to be able to be put away or put aside in a hurry. Re-painting the doors to this cabinet would certainly have been a multi-day project involving dust and paint and being out in the hot sun. Instead, I was able to paper all four doors within a single nap and had no major mess to clean up when I was done! You guys know by now that for us, temporary is the name of the game. There is no telling where this unit will be in our next home…how it will function, what color I will need it to be. 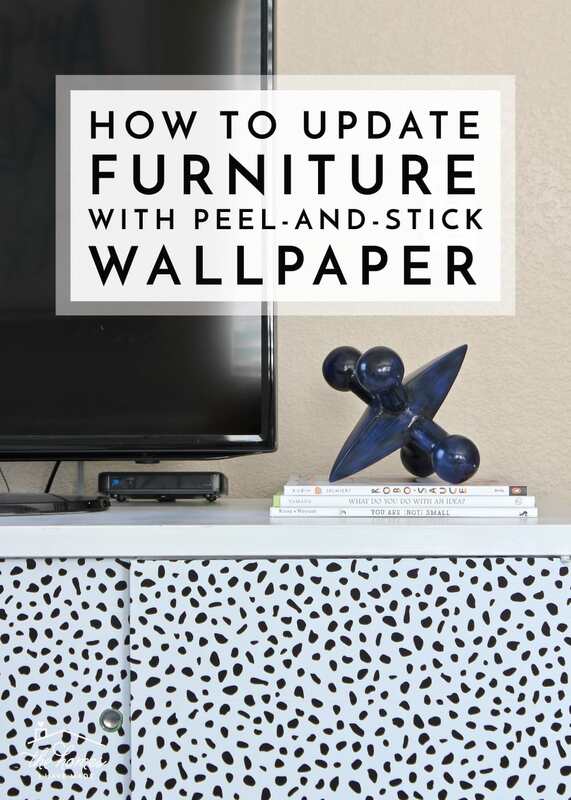 Using peel-and-stick wallpaper allows me to customize this piece for this home without a whole lot of commitment or hassle…and I can change it, guilt-free, whenever I’m ready! Another fun thing about using wallpaper is it doesn’t have to be all-or-nothing (as is often the case with paint). You don’t have to paper your entire piece to give it an entirely new look. 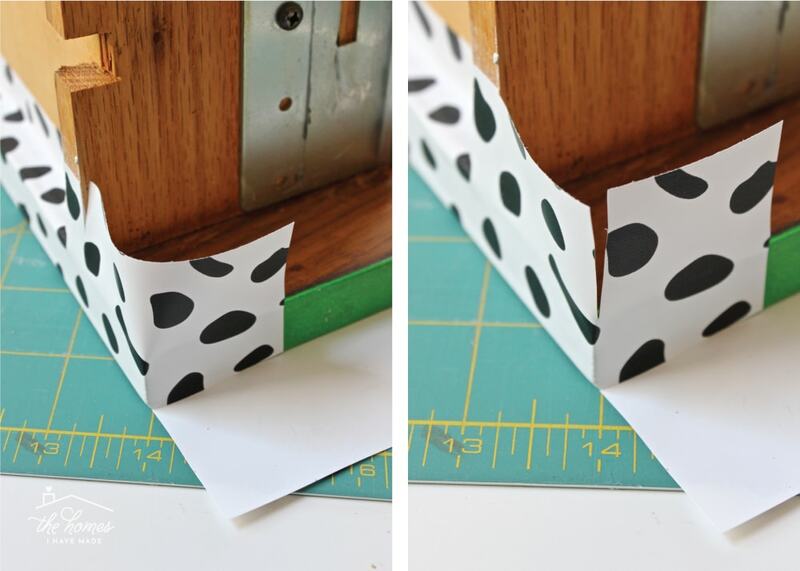 You can add paper to the back of a bookcase, wrapped around drawers or doors, or just along the top surface. 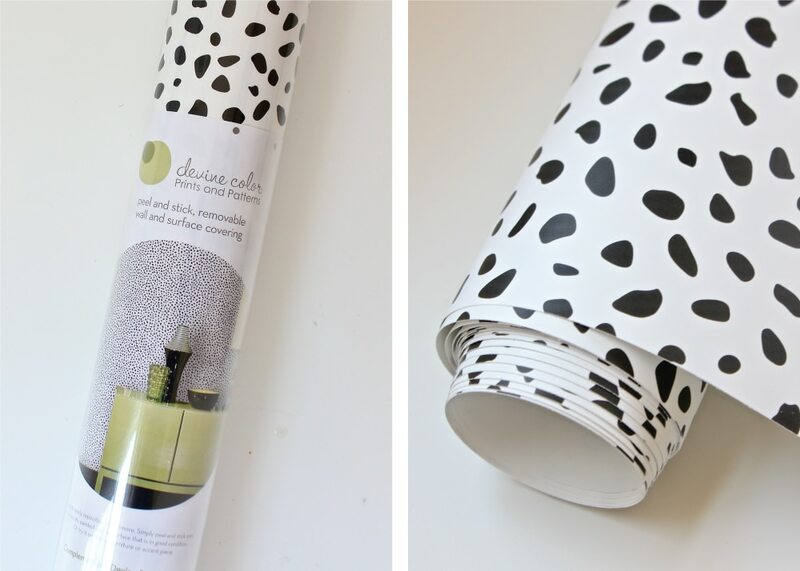 A single (or even half) roll of paper can go a long way in changing how something looks in your space! These days, there are so many different peel-and-stick products available to choose from. 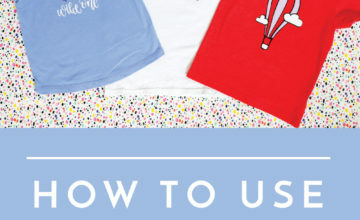 If your peice will be in a high traffic area or will be “handled” a lot, consider using a heavier-duty paper such as Spoonflower’s woven paper (I used it here and here). If the piece is more for looks or won’t be touched a whole lot, almost any paper will do. More and more, I am relying on Target’s Devine-brand wallpaper. 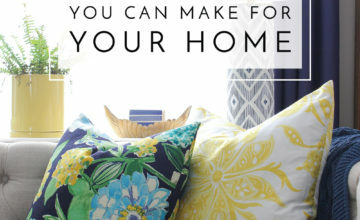 Not only do I find the colors and patterns perfect for my style and our home, but I am constantly finding rolls discounted or on clearance on end-caps. Since this type of makeover is temporary, I prefer not to spend a lot as it will likely come off and go in the trash eventually! I scored this roll half off during an online promotion, making this easy furniture update around $15. Just a word of caution when picking the paper for your project: matching patterns can be a really, really big headache on projects like this. 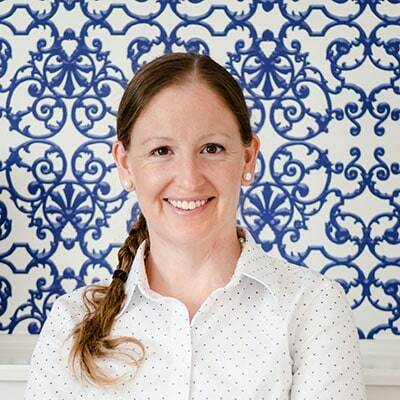 As such, I recommend picking an overall pattern that won’t require matching or carrying the pattern precisely across different components of the furniture (e.g., from drawer to drawer). Based on your unique piece of furniture, you might need more or less tools. 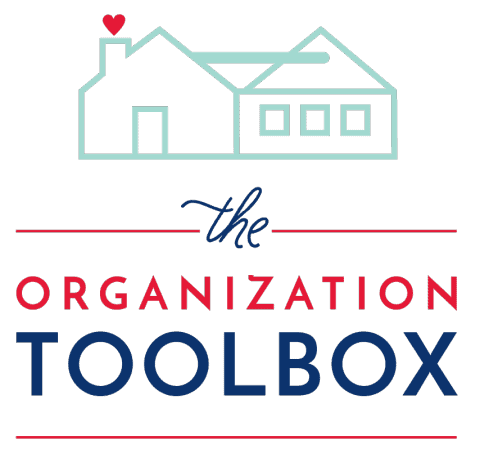 These are the tools I found most handy for this project! Admittedly, each piece of furniture will be so unique in how you go about covering it with wallpaper (so be sure to consider the nuances of your peace in conjunction with this tutorial). In my experience, items with clean, straight lines are ideal candidates for this kind of update; and if papering the frame of your unit seems too complicated, simply covering doors, drawers, tops, backings, insets or fronts can have an equally as transformative effect. For this project, I chose to only paper the drawers and doors of the credenza. Not only would the white frame work with the dotted paper, I knew papering the entire peice would be a much larger under-taking (requiring more skills, more time, and more paper!). 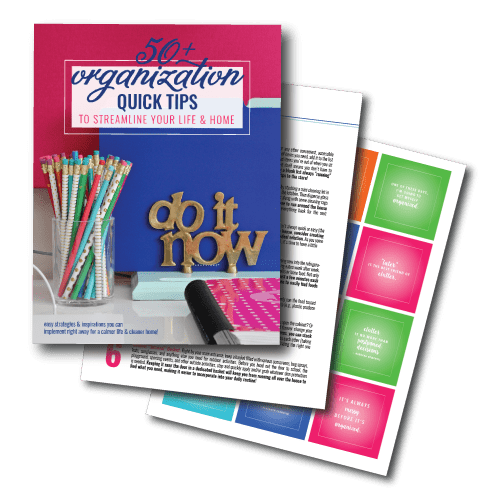 Analyze your peice and consider what should be papered before getting started! Start by taking the drawers and doors off of your peice. If posible, also remove any hinges or other hardware that may prevent a smooth wallpaper application. With the drawer/door off, you can then use it to determine how big to cut the wallpaper. 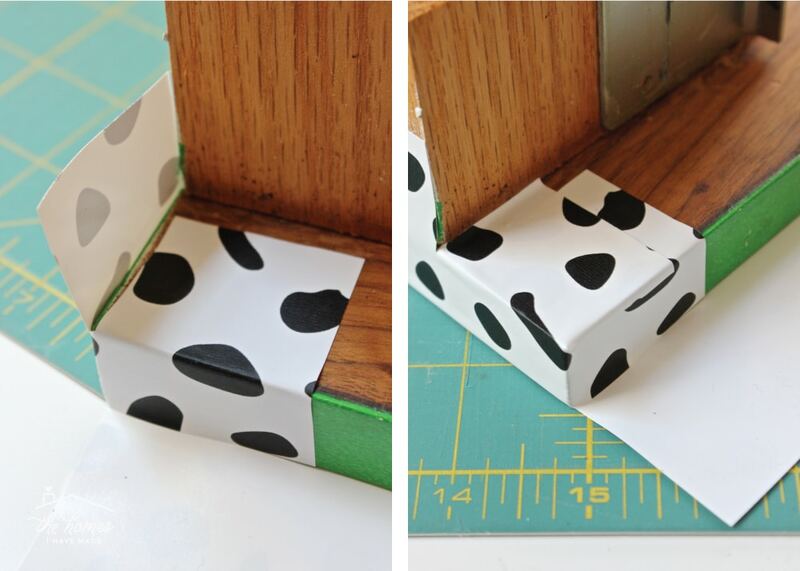 Lay the drawer/door down onto the wallpaper, then add 1-2″ on all sides to allow for plenty of paper to be wrapped around the sides and back of each edge. 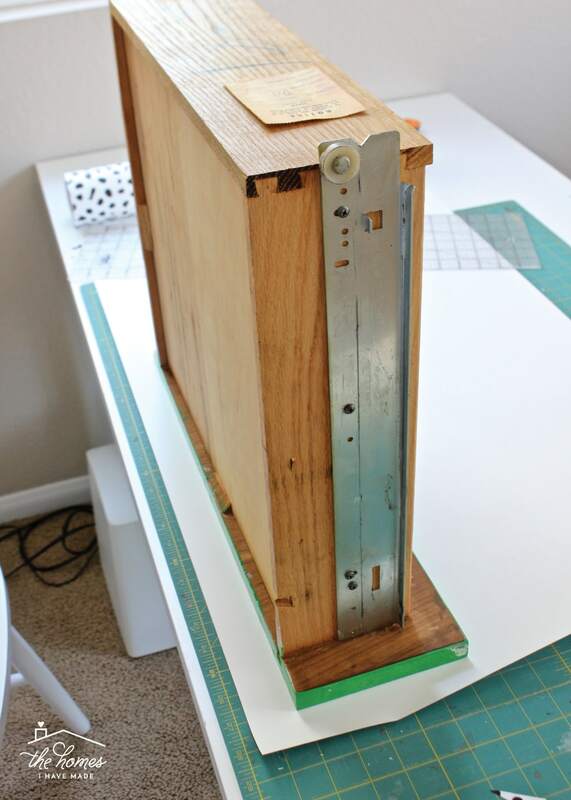 NOTE: How much extra you cut will depend on the thickness of the drawer/door front. You want at least an inch of paper to wrap on the very back side of each edge so measure accordingly. With the paper cut, remove the entire paper backing from the wallpaper. 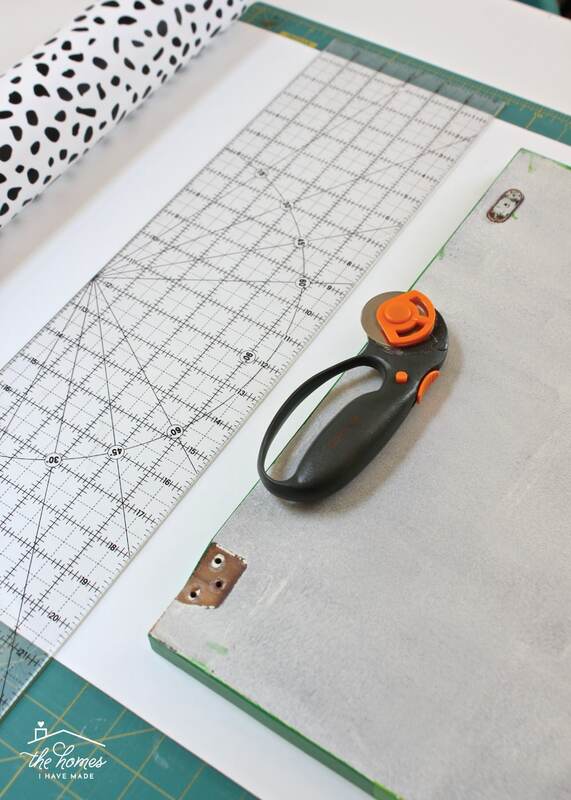 Place the wallpaper patterned-side down (sticky side up) onto a clean and stable work surface. 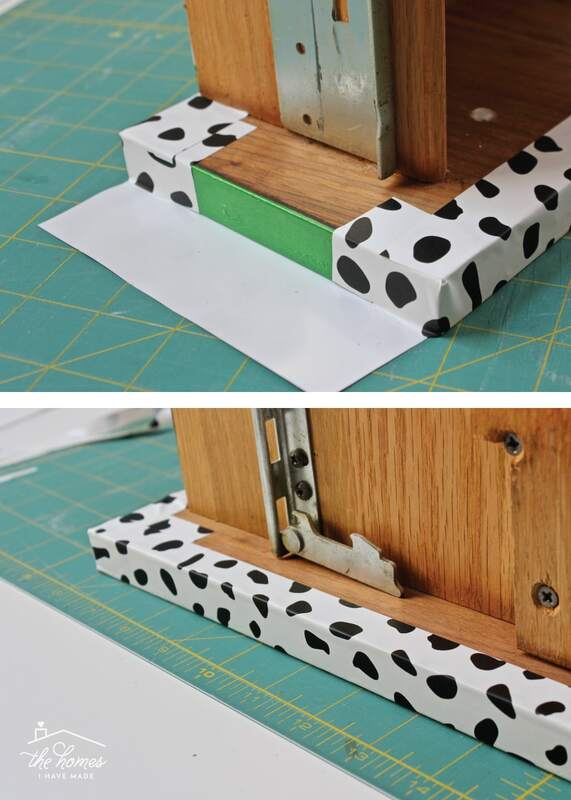 Then, place your clean and hardware-free drawer/door onto the sticky side of the wallpaper. Placing the drawer/door onto the paper this way ensures you have it straight and even all the way around (rather than trying to lay/spread it down like you would inside a drawer). 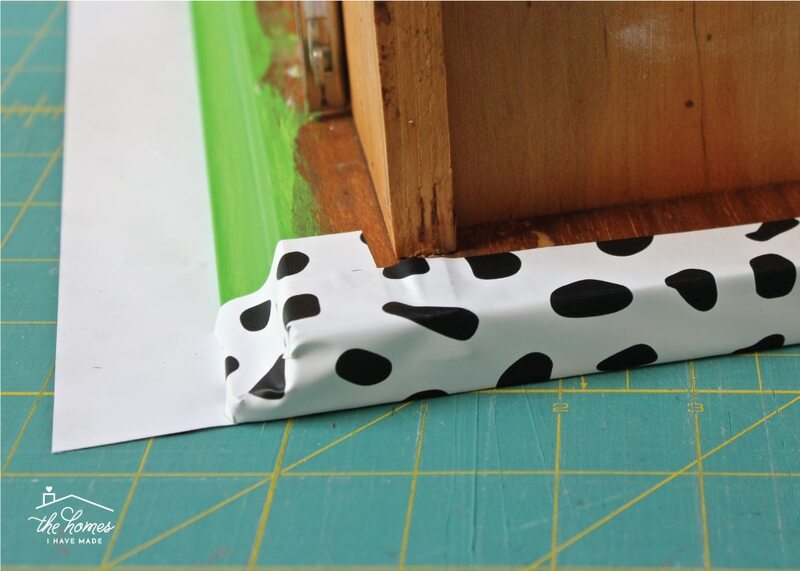 Flip the drawer/door over and use a brayer to smooth out any bubbles or creases. 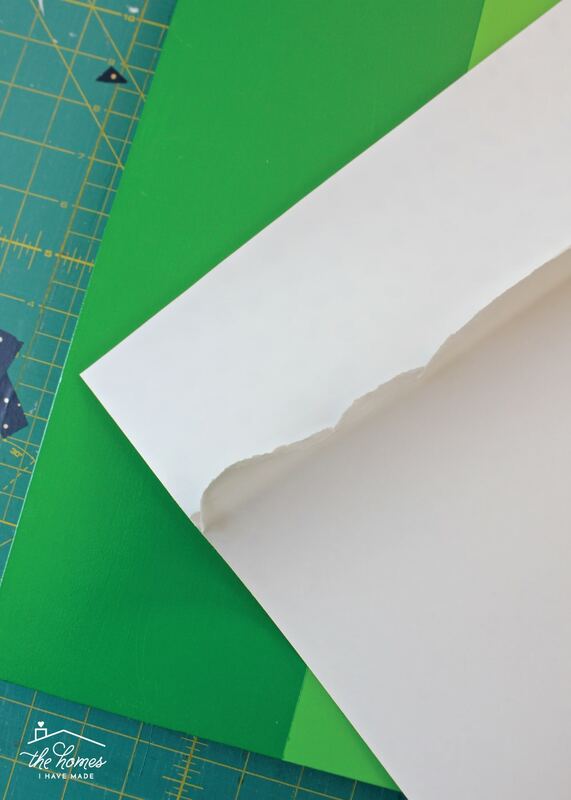 Before moving on, ensure your pattern is straight (if necessary) and exactly where you want it, because once you get cutting and folding, it will be much more difficult to fix. Wrapping doors and drawers is much like wrapping a peresent. However, the corners are where it gets really tricky. Not only do you want everything to be fully covered and look nice and tidy, but you want the paper to lay as flat and smooth as possible so your drawers/doors open and close without issue. After much experimentation, I found a method that produces those neat, clean corners each and every time! 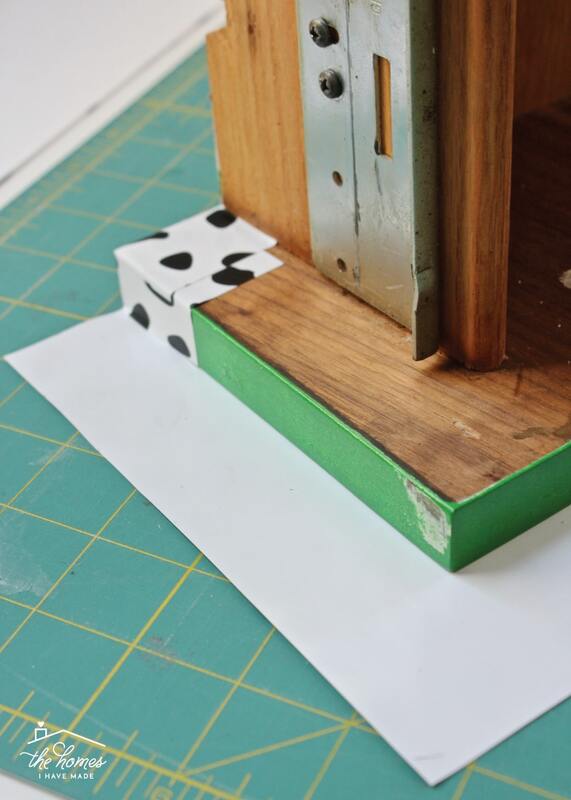 Using a sharp X-actio knife, make a cut parallel to the side of the door/drawer, as shown below. Bring the bottom edge up, folding the excess flap in 90 degrees onto the next edge (below left). 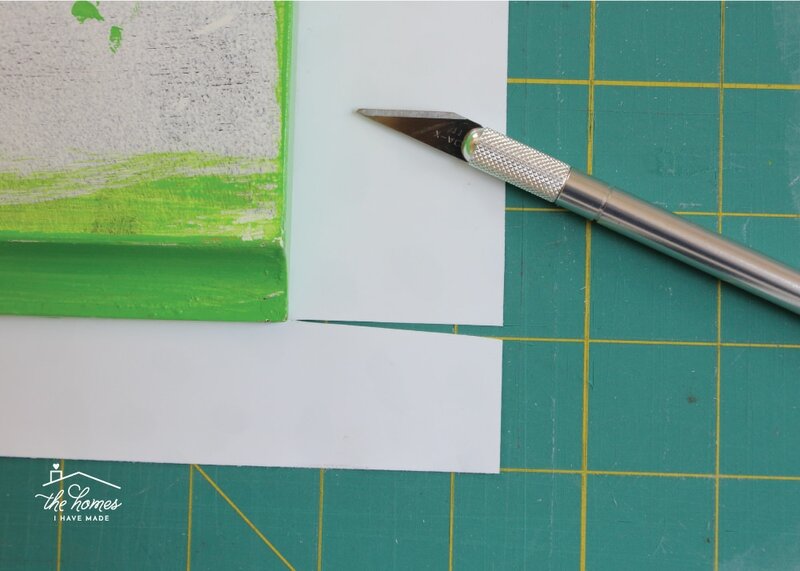 Then, slice down the paper on the corner, just until the blade meets the door (below right). This slice will allow you to neatly fold in each flap as tight as possible, creating a clean and covered corner. Repeat this process on all the corners. Once the corners are folded, you should be left with a single straight edge that can then be pulled up and over the drawer-door edge for a clean, smooth finish. 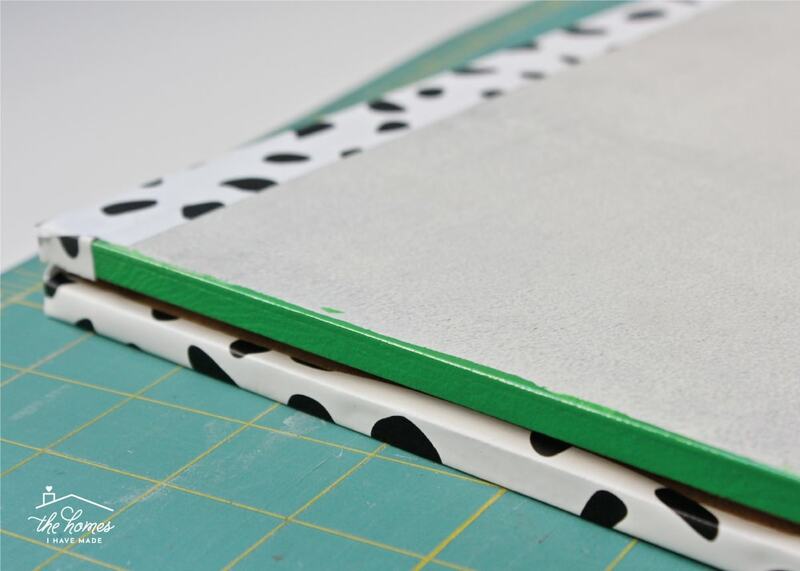 It can take some practice and patience to get the corners covered just right, so you may want to consider practicing on a book or box until you get it. Once you do though, you’ll have those doors and drawers wrapped in no time! 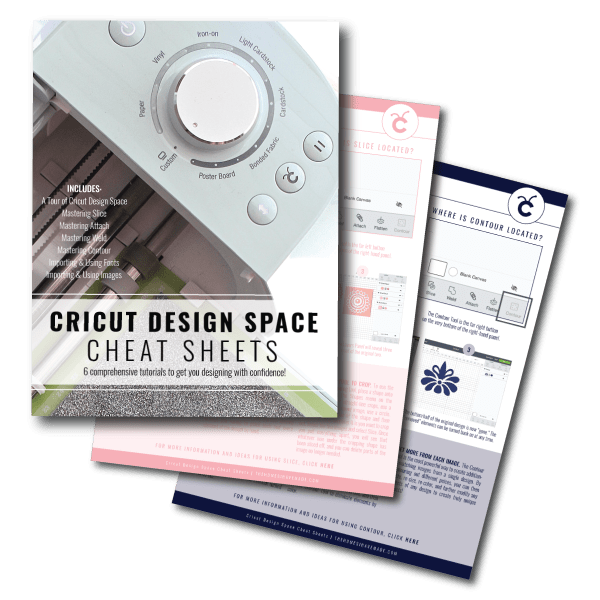 Unless you are working with a pretty simple and straight stock item from IKEA, you are likely to encounter unique edges, angles and other decorative elements on your drawers and doors. While you generally want to avoid anything carved, raised or decorative along the faces of the drawers/doors, don’t be too discouraged by beveled or mitered edges or unique door hardware. Almost anything can be worked around with patience! 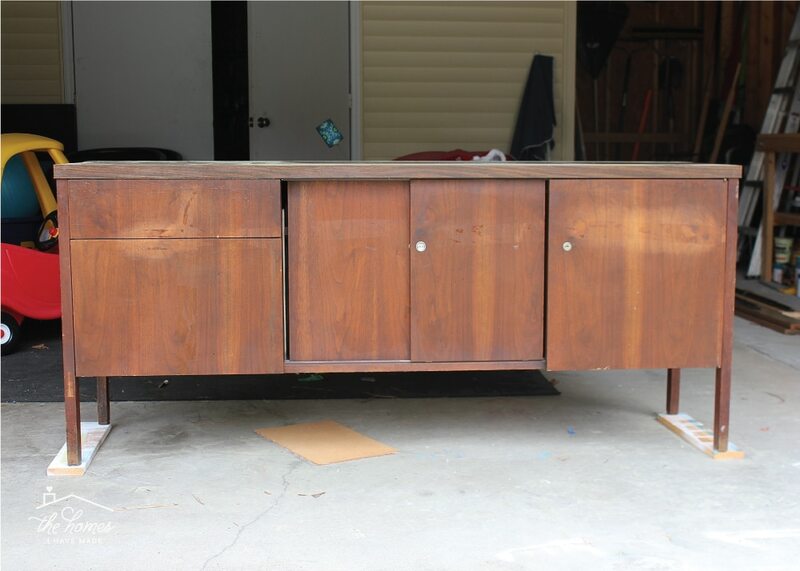 For example, although this credenza featured pretty clean lines, each of the drawers and doors has this unique bevel on one side (to make for easier grabbing). With some patience, the same corner folding technique I outlined above worked just great! Additionally, the two middle doors, although plain rectangles, had grooves along the bottom that allow for sliding. If I papered right over this grove, the doors would no longer fit into the grooves nor work properly. Instead of papering all the way to the back like I did on the other drawers/doors, I slid the paper into the grove and smoothed it flat. The paper looks clean from the front, and the doors work great. Finally, I recommend removing handles and hinges wherever possible, but sometimes that’s impossible. 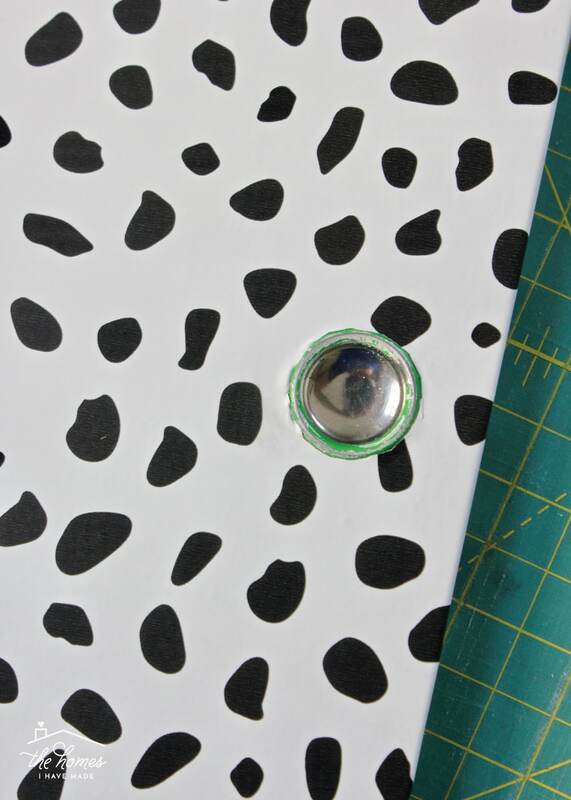 These little round “knobs” are not removable (which is why they have green paint on them from the first makeover! ), so I simply sliced the paper around the knobs with the sharp X-acto knife as I smoothed it flat across the front of the door. It’s not a perfectly clean cut, but from a distance, you can hardly tell! You are unlikely to find these exact “oddities” on your piece of furniture, but I show these three examples only to highlight the fact that this type of project will require some ingenuity. 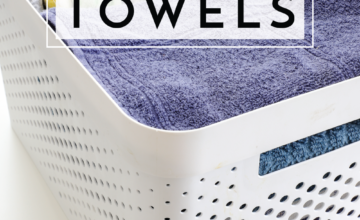 You may have smooth sailing with perfectly clean, square doors and drawers. But if you don’t, you’re project isn’t doomed! 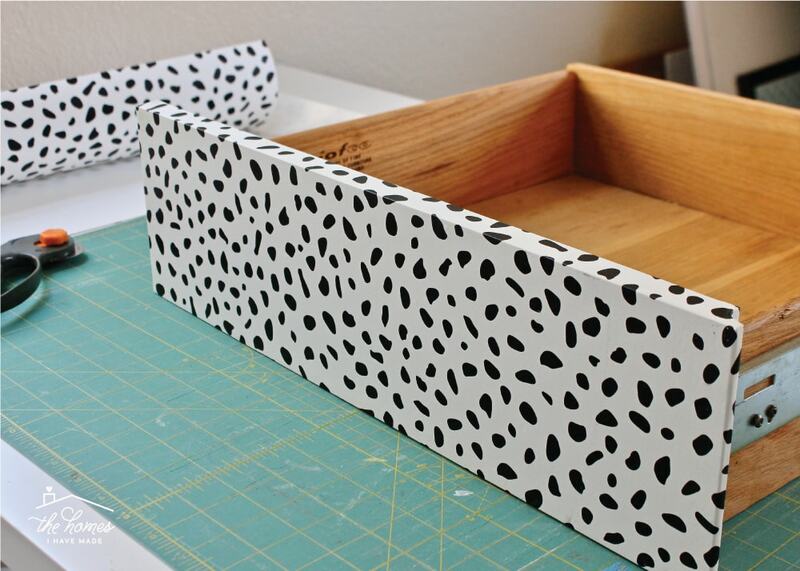 Use a little out-of-the-box thinking and some clever cutting-and-wrapping to cover your doors and drawers in style! This makeover was everything I needed it to be right now: quick, easy, budget-friendly…and honestly…it just looks so good! For two years, I’ve been staring at that bright green cabinet, thinking to myself (almost daily! ), “When am I going to get those doors and drawers painted?” Once I had the idea to wrap them in peel-and-stick wallpaper paper instead, the project was as good as done! 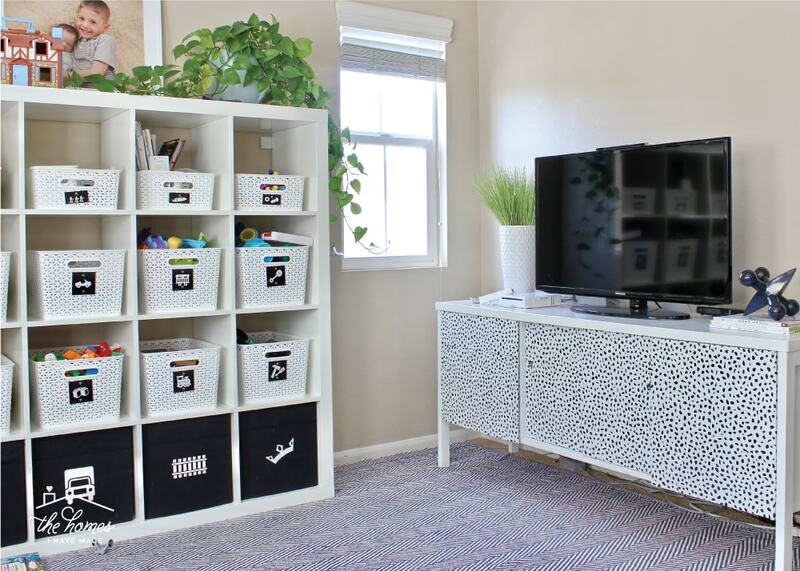 The cheetah pattern is fun and whimsical for this play space, and the black and white motif works SO much better with everything else in this room. Friends, I have two projects left in here and then am ready to show you the whole thing all together! And since our downstairs is currently in shambles from our recent flood, my attention is laser focused on this room right now! The end is in sight! Our summer was off to a bit of a rocky start with our household flood, but I think we’re slowly getting into a new summer normal. If you can believe it, this week marks 2 years in this 7th home of ours…so back here on Friday, I’m going to update you where we’re at and what I’ve got planned for our final year here! See you then! Celebrating 2 Years In Our 7th Home | What We've Done & What's Left to Do!